There are 8 primary types of reports that can be viewed individually, or compared to each other. These topics explain how the different reports relate to one another. Important: This help topic does not apply to any New Reports. If you're using Bronto's latest report format, please refer to the help topics for new reports. Reports are designed in such a way that you can start at a broad scope, and drill-down to more specific levels of reporting. In the case of a message, you start very broad by viewing a message report. A message report is an aggregate of all the metrics for all the deliveries made using that message. Often times, multiple deliveries are made from a single message. So, if you want to further filter your metrics by a particular delivery, you can view a delivery report for a specific delivery. A delivery report contains all the metrics pertaining to that particular delivery of the message. Often times, deliveries are sent to multiple lists and/or segments. If you need to further filter your metrics by a particular list or segment, you can drill-down and view a delivery recipient report. The delivery recipient report contains all the metrics pertaining to a specific list or segment a delivery was sent to. In the case of a delivery group, you start very broad by viewing a delivery group report. A delivery group report is an aggregate of all the metrics for each delivery added to the delivery group. From here, if you want to further filter your metrics by a particular delivery, you can view a delivery report for that delivery. A delivery report contains all the metrics pertaining to a particular delivery added to the delivery group. Often times, deliveries are sent to multiple lists and/or segments. If you need to further filter your metrics by a particular list or segment, you can drill-down and view a delivery recipient report. The delivery recipient report will contain all the metrics pertaining to the list or segment the delivery was sent to. In the case of an A/B split test, you start very broad by viewing a report for an A/B split test. An A/B split report is an aggregate of all the metrics for each split group used in the A/B split test. If you want to further filter your metrics by a particular split group, you can view a delivery report for that split group. 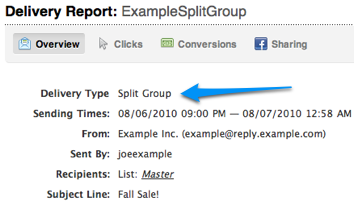 The Delivery Type for a delivery report that represents a split group will say "Split Group". A delivery report for a split group contains all the metrics pertaining to that particular split group. Often times, deliveries representing a split group are sent to multiple lists and/or segments. If you need to further filter your metrics by a particular list or segment, you can drill-down and view a delivery recipient report. The delivery recipient report will contain all the metrics pertaining to the list or segment the delivery representing a split group was sent to. In the case of an automated message rule, you start very broad by viewing an automated message rule report. An automated message rule report is an aggregate of all the metrics for every delivery made via the automated message rule. Automated message rule reports are slightly different from message and A/B split reports in that if you want to further filter your metrics, you do so using dates instead of deliveries. You can filter the metrics by individual days or date ranges of your choosing. Message reports represent an aggregate of the metrics associated with all of the deliveries made using a message. A delivery report contains all of the metrics associated with an individual delivery of a message. A delivery recipient report contains all of the metrics associated with an individual delivery sent to a specific list or segment. A delivery groups report contains all of the metrics associated with each delivery or post added to a delivery group. An A/B split report is an aggregate of all the metrics associated with an A/B split test. SMS message reports represent an aggregate of the all the metrics associated with all of the deliveries of an SMS message. A workflow report contains all of the metrics associated with deliveries made via a workflow. An automated message rule report is an aggregate of all the metrics associated with all the days an automated message rule has been sending messages. Report sections are the grouping of metrics that are found on reports. Comparison reports allow you to add multiple items to a single report and compare their metrics. The Legacy Reports dashboard allows you to quickly get an overview of the activity going on in your account. You can also access more detailed reports from the Legacy Reports Dashboard should you need more specific information. The Report Downloads page is where you can access and download reports you have run or reports related to your contact import activity. You can access this page by going to Reports > Legacy Downloads.